Daimler has taken the wrap off three cars under its Blue Zero project. The first is the Blue Zero E-Cell, a fully electric motor that can travel up to 200km on a single charge. The Blue Zero E-Cell Plus is a hybrid, which couples the electric motor with a small, efficient petrol engine designed by Daimler’s other brand, Smart. And finally, the Blue Zero F-Cell. It’s the same electric motor, but has a hydrogen fuel cell for company. While the F-Cell seems a bit far away, the E-Cell and E-Cell Plus are being worked on for markets across Europe, North America and India too. The Panamera will be here in just two weeks. It is Porsche’s first and only series-production four-door car. Unlike the Cayenne, the Panamera is every bit a Porsche sports car. The thumping 400 bhp V8 motor allows you to cruise along at high speeds. But expect the prices to go through the roof, with a wide range from Rs1.5–2 crore across variants. India will get all the variants, which include the 4S and 500 bhp Turbo. It’s great that India is getting this car on schedule with many other world markets. BMW is experimenting one segment lower than the XC60 and making the compact SUV even smaller. The result is a dynamic, attractive, performance-oriented sub-compact SUV. The X1 is all of that and more. It has all-wheel drive standard and comes with a choice of two petrols or a 2-litre diesel heart with varying output of 140-200 bhp. The X1 is well appointed inside, with great visibility, reasonable ride height and plenty of on-board electronics. It will debut in 2010 in the Rs25-30 lakh bracket and is expected to hijack some premium sedan buyers. This one is a wonder car. While we did see e-cars in all shapes and sizes, the E-Up! is a bold experiment from Volkswagen since the company says it will also be made for emerging markets. The E-Up! is based on its Up! concept that debuted here in the last edition. The Up! is Volkswagen’s next-generation small car that will spawn not just a city hatch, but also a small multi-utility vehicle and yes, now the electric car too. It runs on rechargeable lithium-ion batteries and a full charge takes 5 hours. The car can do 0-100kmph in 11.3 seconds and has decent torque at 210nm. The power output of the electric motor is 40-60kW, or about 50-80 bhp, depending on the mode you drive in. Volkswagen will introduce it in India too. After all, for this car to be commercially viable, it needs large-scale production. This can happen globally only if there is a sales plan in emerging markets. 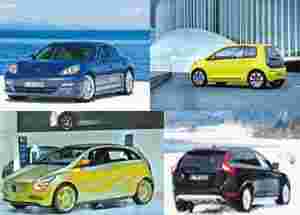 It also means that these cars can’t be too expensive, because let’s face it, in markets such as India, price matters, especially in the hatch space. The Up! small car will begin to roll in late next year and the E-Up! will debut by 2012-13. It is difficult to predict a price range, but Volkswagen says it will have to be competitive to do well. Get ready to welcome another compact SUV, the Volvo XC60. Though no date has been set yet, it is certain that the XC60 will be the company’s next offering in India in 2010. It has a host of engine options in petrol and diesel, but Volvo will push the diesels in India. The XC60 is expected to be in the Rs30-35 lakh price band. It shares technology with the recently launched Land Rover Freelander, but it also has its own highlights, such as the City Safety System. This allows the car to use its brakes, or decelerate in slow city driving conditions, to avoid accidents. City Safety may be too sensitive for our chaotic city traffic, but the ride quality, interiors and good engine options should help the XC60 in the Indian market. I drove the XC60 on the out skirts of Frankfurt, and its ease of use and excellent highway handling—plus manoeuvrability in city traffic—impressed me. The XC60 went on sale earlier this year in most of the markets Volvo operates in, but you’ll still have to wait till 2010. Let’s hope Volvo keeps the pricing competitive. The author is editor, auto, NDTV.